Quality rice paper Japanese lanterns as used through centuries of Japanese history to the present day. An ukiyoe design of a Kyoto geisha graces this handmade paper lantern. 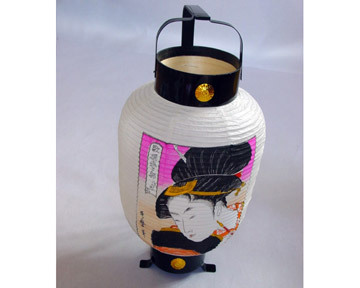 An ukiyoe design of a Kyoto geisha graces this handmade paper lantern. A beautiful decorative piece for any room. Ukiyoe (pictures of the floating world) originated in the 18th century, and the vivid images of popular teahouse girls and geisha girls capture an atmosphere of pleasure and fun.